Your day-by-day itinerary now includes Painted Ladies, Lombard Street and Fisherman's Wharf. 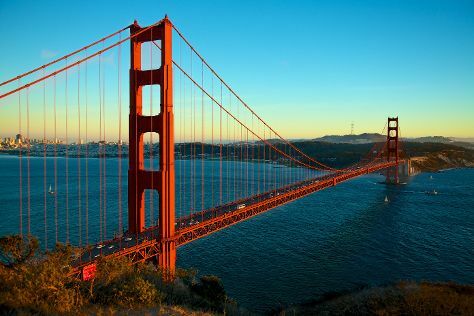 It doesn't end there: take in the views from Golden Gate Bridge and head off the coast to Alcatraz Island. For photos, more things to do, other places to visit, and other tourist information, refer to the San Francisco tour itinerary maker app . If you are flying in from Luxembourg, the closest major airports are San Francisco International Airport, Metropolitan Oakland International Airport and Norman Y. Mineta San Jose International Airport. In August, daily temperatures in San Francisco can reach 26°C, while at night they dip to 17°C. You'll set off for Monterey on the 17th (Sat). Monterey is a city in the U.S. Your day-by-day itinerary now includes Blue Ocean Whale Watch, McWay Falls and Bixby Bridge. Kick off your visit on the 17th (Sat): appreciate the views at Silicon Valley, then get up close to creatures of the deep with Blue Ocean Whale Watch, and then contemplate the waterfront views at Monterey Bay. Keep things going the next day: take in the views from Bixby Bridge and then admire the sheer force of McWay Falls. To see traveler tips, other places to visit, photos, and tourist information, read Monterey road trip planning app . You can drive from San Francisco to Monterey in 2.5 hours. Alternatively, you can fly; or do a combination of train and bus. In August, daytime highs in Monterey are 24°C, while nighttime lows are 16°C. Finish your sightseeing early on the 18th (Sun) so you can drive to Santa Barbara. To find photos, other places to visit, more things to do, and other tourist information, refer to the Santa Barbara holiday tool . You can drive from Monterey to Santa Barbara in 4.5 hours. Other options are to fly; or do a combination of shuttle and flight. Expect somewhat warmer weather when traveling from Monterey in August: highs in Santa Barbara hover around 28°C, while lows dip to 18°C. Finish your sightseeing early on the 19th (Mon) to allow enough time to drive to Los Angeles. Pack the 21st (Wed) with family-friendly diversions at Universal Studios Hollywood. There's lots more to do: see the interesting displays at The Getty Center, see the sky in a new way at Griffith Observatory, appreciate the extensive heritage of Hollywood Walk of Fame, and make a trip to Santa Monica Pier. To find photos, other places to visit, where to stay, and tourist information, read our Los Angeles trip itinerary maker app . Drive from Santa Barbara to Los Angeles in 2 hours. Alternatively, you can take a bus; or take a train. In August, Los Angeles is a bit warmer than Santa Barbara - with highs of 34°C and lows of 22°C. Wrap up your sightseeing on the 23rd (Fri) early enough to travel back home.